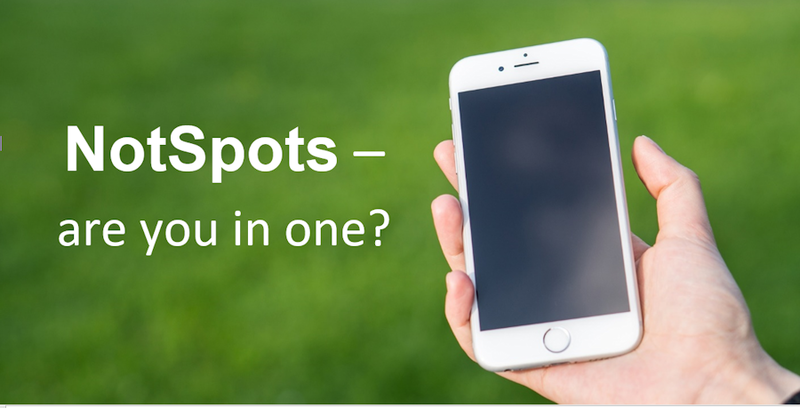 NotSpots – are you in one? Everybody has a mobile phone today don’t they? Most people do and certainly if you’re in business you can’t survive without one. Today’s mobile phones are immensely powerful computers – they run on the mobile signal or wifi, they can take really good photographs, they’re able to record videos, they operate a myriad of apps that let you watch TV, play games, do your banking and much more. But what happens when you can’t get a signal? We’ve all seen people waving their phones about trying to get a signal, but what happens when you can’t get broadband either? You would think that in this day and age there would be very few areas where there’s no signal of any kind – but even some business estates have weak or poor signals. Even the farming community rely on their mobile phones – and the issue of NotSpots was covered on Countryfile recently. If you find your broadband signal is dodgy it makes doing business more challenging than it should be. Today’s world is totally dependent on being connected to the internet. Even when people attend events that take place in the middle of a field they expect to be able to get online. So – what can you do to improve the situation if your business or an event you’re running is in a NotSpot? Short term you can have a satellite connection installed. When we set up external events that are literally in the middle of a field miles from anywhere, this is what we do. This means that, regardless of the mobile phone signal, anyone with a smartphone can piggy back on the WiFi – and use both their phone and the internet. With a satellite connection the signal doesn’t have any physical obstructions like hills or buildings, it’s literally bounced off a satellite in space. Longer term a leased line can be installed, but this is a permanent solution and requires a certain amount of investment. In fact, if you’re in a business area where the current broadband offers low levels of connection (e.g. up to 3MB download and only half a MB upload) you could find it worth looking at an alternative. Getting a dedicated line installed for your broadband can offer a guaranteed 10MB both up and downloading. You’ll get better stability and no sudden drops when there are more people online. So whether you’re planning a pop concert in a field or simply frustrated at the unreliable or low level of broadband in your current premises, there’s a solution. If you’d like to know a bit more, just give us a call on 01702 668730.